A wall mural adorns a parking lot near the Cours Saleya market in the Old Town of Nice in Provence, France in Europe. Many people visit the Cours Saleya market while touring the Old Town of Nice in Provence, France and most of them pass by this unique wall mural which seems very realistic. 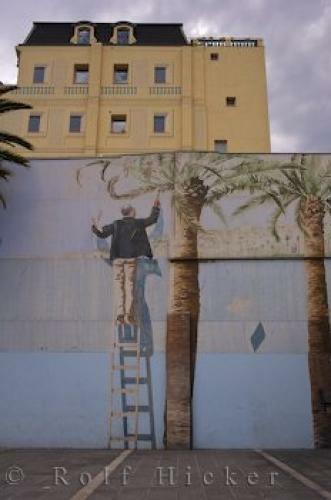 The man on the ladder appears as if he is still painting the mural when in fact he has been painted right into the picture. This wall mural took the artist some time to paint to ensure all the details were put in to give it these special effects.While venturing to the Cours Saleya market in the Old Town of Nice, be sure to stop at this wall mural to capture a picture for your memory book to Provence, France.Wall Mural near the markets, Cours Saleya in the Old Town of Nice, Provence, Cote d'Azur, France, Europe. in the Old Town of Nice in Provence, France.